José de Ribera rendered this classic portrait of St. Andrew in oil on canvas circa 1616. Catholics and Orthodox Christians reserve today to commemorate the apostle Andrew, “the first-called.” On this feast, the successor of St. Peter sends a delegation to the Turkish city of Istanbul — the former imperial city of Constantinople — where they honor the memory of Peter’s brother with the ecumenical patriarch, who according to tradition is the successor of St. Andrew. This shared celebration between the churches of Rome and Constantinople reminds us of how much Catholics and Orthodox share. For those of us who have participated in the dialogue of the Catholic and Orthodox churches these past 40 years, it has been an exhilarating experience. Sometimes a healthy dose of realism is needed to remind us that, in order to achieve reconciliation and restore full communion, we must overcome a millennium of tension, discord, prejudice and hatred. We have learned to define ourselves by what we are not. This attitude remains common in the world at large and among Christians in particular. The events of the last 20 years — the unraveling of the Soviet Union and the decline of its allies, the increase of violence in the Middle East and the resurrection of nationalism in the Balkans for example — have thrown this into relief by liberating many of the sentiments and feelings held in check for at least 50 years. The Christians affected by these changes, particularly those who had once lived with some limited freedoms and those who now rise from the well of oppression, have to recognize that relations between the Christian East and the Christian West have evolved. In Europe, the vast majority, clergy and laity alike, have been asked by their leaders (many of whom, rightly or wrongly, were perceived as collaborators with oppressive regimes) to accept ideas and participate in activities they understand as unfaithful to their traditions and faith. They fear for their national, cultural and spiritual identities, which seem threatened. And some comfortable institutions, structures that have withstood many tests over the centuries, may in fact have to be dismantled. Daunted by the magnitude of Christian renewal and re-evangelization, and strapped for resources and personnel, some in positions of leadership have no time for ecumenism. Catholics and Orthodox have a strong sense of the ecclesial and religious life anchored in tradition. We recognize that it is a living tradition in which the Holy Spirit is constantly at work, both in word and sacrament. The core of our disappointments in these last 15 years is our struggle to maintain the tension between “the revelation given once and for all to the saints” and to the Spirit who continues to speak. Since the end of the 19th century that Spirit has been at work as Catholics and Orthodox have progressed from estrangement to reconciliation. The events of the past decades cannot be undone. The documents published cannot be unwritten. They challenge and inspire and, as we continue in this new millennium, they will stand in judgment upon us if we avoid them. To read more, see A Century of Catholic-Orthodox Relations. Boys watch at the shore as a boat of fishermen heads out to sea in Kerala, India. Today is the feast day of St. Andrew, the patron of fishermen. In this image from our archive, taken in 1990, fishermen in India head out to sea at sunset. 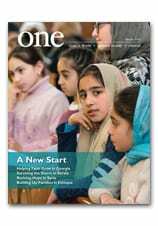 In the current issue of ONE we sat down and spoke with CNEWA’s new president, Msgr. John E. Kozar, about his life and vision for CNEWA. Watch the clip above to learn more about him. Check out the full interview on our web site. For more from this story, see Far From Home by Nicholas Seeley. On 17 November 2011, at a meeting of the Catholic Patriarchs of the Orient in Lebanon, the bishops once again called on all Christians to agree on a single date for Easter. At present the Roman Catholic and Protestant churches calculate the date of Easter differently than the Orthodox churches. This results in both sets of Christian churches often having different dates for Easter. The bishops believed that all Christians celebrating Easter on the same day would be a sign of Christian unity. When I was asked to write on this, I thought that there were some deep theological differences involved. Research into the topic made me realize that I was in the exciting area of “things I thought I knew but didn’t.” To understand more, you have to start at the beginning — the very beginning. I know that the Gospels are not in total agreement about the date of the Last Supper. The Synoptics (Matthew, Mark and Luke) see the Last Supper taking place on the first day of Passover, which began at sundown on Thursday. John, on the other hand, sees the Last Supper taking place on the evening before Passover, which according to John would have begun Friday at sunset. I was aware of a group of Christians in the early church called the “Quattuordecimans” (”Fourteeners”) who celebrated Easter on the 14th of Nisan, the same day Jews celebrated Passover. For the Quattuordecimans, Easter could fall on any day of the week. Most Christians, however, celebrated Easter on the Sunday after Passover. There were some controversies between the two groups. The Council of Nicea (325), however, settled the matter and decreed that Easter would be on the first Sunday after the first full moon of the spring equinox in the northern hemisphere. The date of the equinox, with some slight astronomical inaccuracy, was determined as 21 March. It would seem, then, that the question was solved in 325. What was the problem? The problem was not based on a deep, theological or mystical difference. The problem was based on an astronomical calculation: the length of the calendar year. The Julian calendar in use during the first 15 centuries of Christianity assumed that the solar year was 365 days and 6 hours. The problem is that the solar year is about 10 minutes and 48 seconds shorter than that. So what? Well, it really doesn’t make that much a difference — over a short period of time. However, over a longer period of time, it can make a big difference. By the time of Pope Gregory XIII (1582), after whom the Gregorian calendar is named, the difference meant that the spring equinox was falling on 11 March — some 10 days earlier! Pope Gregory proposed — actually decreed — a new calculation to the calendar, which went into effect on 24 February 1582. In addition to using a more accurate measure for the length of the solar year, the Gregorian calendar “dropped” 10 days when it was inaugurated. It took several centuries before all countries accepted the new Gregorian calendar. Both political and denominational reasons made many hesitant to accept a “popish” change in the calendar. However, the Gregorian calendar slowly won out. When the British Empire and its colonies accepted it in 1752, 11 days had to be “dropped” to bring the calendar in line with the new calculations. The last of the Orthodox Christian countries to accept the Gregorian calendar was Greece in 1923. By that time, 13 days needed to be “dropped.” Thus by the mid 20th century, the Gregorian calendar was the dominant calendar in the world, although other — mostly religious — calendars, e.g. Muslim, Jewish, Persian, etc., still continue to exist. The “problem” with the date of Easter has to do with when the spring equinox occurs. In the Gregorian calendar, it always occurs on 20 or 21 March. The present difference between the Gregorian and Julian calendars is 13 days (thus the spring equinox in the Julian calendar is on about 8 March). In 2100 the difference will be 14 days. To help bridge the gap, in 1923 some Orthodox churches proposed a revised Julian calendar, which was corrected against the solar year by dropping 13 days. However, not all of the Orthodox churches chose to adopt the revised Julian calendar and those that did chose it to calculate the dates of fixed feasts and not the date of Easter. In 1997 at a meeting in Aleppo, Syria, the World Council of Churches proposed that the date for Easter be calculated using astronomical observations for the spring equinox and full moon based at the meridian of Jerusalem. This would have disregarded the question of Gregorian vs. Julian calendar and would have eliminated the disparity in dates. None of the member bodies of the World Council, however, adopted this solution. For many Christians, especially in the west, the date for Easter is not all that important. For other Christians it is a point of identity. Ultimately the most import issue is whether the common observance of Easter by all Christians would give significant witness to the world. If it would not, then the date or dates of Easter are immaterial. If it would give greater witness, however, the question becomes what theological justification would there be for lessening the impact of Christian witness for what is basically an 11-minute-and-48-second difference in the length of our year? Earlier this week, our own Father Guido Gockel, Vice President for the Middle East and Europe, appeared on “Catholic Matters,” a program on the Guadalupe Radio Network, to talk about the prospects of peace in the Holy Land — a subject he discussed at length during a recent talk in Washington. The audio of his interview appears below. An Ethiopian monk enjoys a lunch of injera and shiro in Tullo Gudo Island, Ethiopia. Tomorrow, many Americans will spend the day enjoying a feast with loved ones. So today, as everyone prepares for the big holiday, we’d like to share some of a feast from CNEWA’s world. It’s the national dish of Ethiopia — injera, which is a spongy, crepe-like bread made from the extremely fine grain known as tef. It is typically eaten with stews and veggies of all sorts. No utensils necessary for this delicacy! Interested in learning how to prepare injera? Check out this recipe on Food.com! The Teresian Association celebrated its centennial in Amman last Sunday, 13 November, with a thanksgiving Mass attended by around 550 people, many of them friends, supporters and benefactors of the Teresians. Since the first members arrived here in 1985, these supporters have journeyed with them, through thick and thin, and made their evangelizing presence grace-filled and meaningful. The presider for the Mass at St. John Baptist de la Salle Church was His Beatitude Archbishop Fouad Twal, Latin Patriarch of Jerusalem. Among the seven concelebrants were Bishop Selim Sayegh, patriarchal vicar for Jordan and a long time friend and spiritual father of the Teresians here in Amman; the pastor of the parish in Jabal Hussein, Father Rifat Bader; and Father Paul Mankowski, S.J., who celebrates Masses in English at several churches in Amman. The highlight of the Mass was the inspiring and challenging talk of Patriarch Twal, who began by explaining the theme of this centennial, “From Grateful Memory to Renewed Commitment,” quoting the present president of the Teresians, Dr. Loreto Ballester, who said that the centenary not only makes members look back at the past with gratitude, but also commit for the future. Furthermore, he noted that the charism of the Teresians is not meant to be kept, but is meant to be given in service to others. The patriarch underlined three points: the vision that St. Pedro Poveda, the association’s founder, had received about the role of the laity in the church and in society 50 years before Vatican II; the importance of education for social transformation; and the lives of the early Christians as our role models. In line with the ideals of Pedro Poveda, he saw that to be modern today is to go back 2000 years and learn how these first Christians loved one another — how they were united and shared their material goods. When talking of the “New Evangelization” called for by Pope Benedict XVI, he said that “new” refers to the context in which we live today. We live side by side with people from many races, cultures and religions, and this new scenario challenges us to be strong in our faith and to have a greater sense of belonging to the church and to this land. Finally, he reiterated his gratitude for what the Teresians do in Amman, Jerusalem and in the Holy Land as a whole. The whole liturgy — animated by the wonderful performance of the Sacred Heart English Language Parish Choir — made this event a memorable day. To learn more about the community, visit their website. Or read about their work in the Holy Land feeding mind and spirit. A student band performs at a school and home for the deaf and blind run by the Assisi Sisters of Mary Immaculate in Thalayolaparambu, a village in the Kottayam district of Kerala, India. Today St. Cecilia, the patroness of musicians and church music, is venerated. She is said to have died singing to the Lord.